Now for those of you that don't know much about Results With Lucy, (have you been living under a rock?) 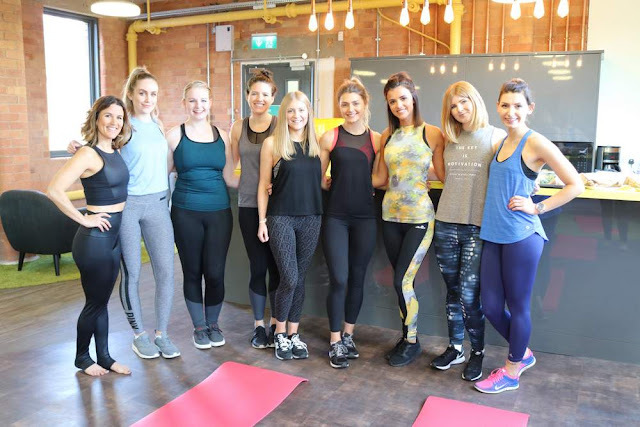 it was set up by the fitness goddess that is Lucy Mecklenburgh, Cecilia her Personal Trainer, and Louise her Nutritionist. It's the most successful online training programme in the UK, and after our workout with Cecilia, and spending some time with Lucy, I can totally see why! I have since signed myself up to the 12 week New Beginnings Plan which I am honestly loving. Each exercise video is so fun and easy to follow, and Cecilia's charisma really translates well onto your laptop screen! The weekly food diaries and food shopping lists are also mega helpful but my favourite thing HAS to be the Eating Out Guide - which tells you which dishes you Can Have, Maybe Shouldn't and Absolutely Should Avoid at All Costs! 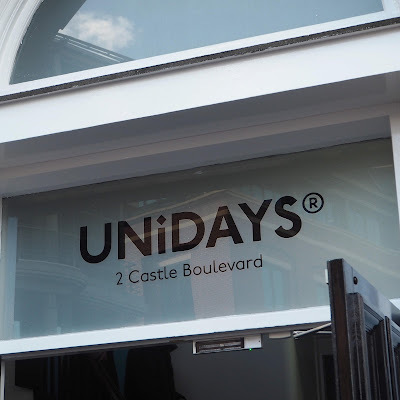 Firstly we all introduced ourselves to one other, there were six bloggers and then Allie from UNiDAYS who joined in on the workout, so it was a really fun and intimate event. Luckily I'd met up with the absolute cutie that is Jaylee (ComicBooksAndYellowDucks) for an obligatory pre-event Starbucks, so I didn't turn up completely alone! Lucy was so friendly and down to earth which was really refreshing, so we were all chattering around the sofas in no time! First up was our nutrition talk with Louise, who told us that carbs are not the enemy (Which was obviously music to my ears). Instead she explained that we need to be replacing refined carbs e.g. white bread, pasta, rice etc with their wholegrain alternatives. She also busted a lot of food myths which was so interesting to hear! We then started our workout which was live-streamed over on Results With Lucy's Facebook page. It was a killer workout (especially for my poor poor legs who had not seen a gym in some time) but it gave me such a boost and really inspired me to kick-start my fitness routine again. Cecilia is also probably the most enthusiastic person I have ever met. She's flipping fantastic! After our super yummy and healthy lunch, we said our goodbyes and I waddled my jelly-legs back to the train station with the most adorable goodie bag in tow. (You can see it's contents over on my YouTube channel). I also vlogged parts of the event and actually got a chance to ask Lucy a couple of health and fitness related questions so click here to watch that! So thank you so much to UNiDAYS for inviting me along to such a cool event, and make sure you make the most of the 25% off Results With Lucy plans. If you are a student and don't have an account it's a really simple process. Go to the UNiDAYS sign up page; you'll then be redirected to your University portal to verify you are in fact a student - Currently crying in a puddle cause I'm no longer one waaaa - and that's it! YOU'RE IN! I hope you enjoyed this post and I expect to be seeing you all on the #RWLFitties hashtag very soon! This session sounds like so much fun, I'm not surprised that you signed up to the online plan afterwards! It's so hard to motivate yourself when you're just exercising at home on your own, so this sounds like a wonderful idea to me! Learning that carbs are not the enemy is also fab, I'm not sure I could live without pasta!! Thanks for sharing! I've heard of RWL but I follow a different fitness program which is more me. I'm glad you've found a program that works for you and sounds like you had a great day with Lucy and a bunch of fab bloggers! This honestly sounds like my dream event! I would love to have gone to this. It sounds like you had a great day. Pre-event coffee meet ups are perfect too! I didn't know RWL was the most successul program, that's so interesting! I can't wait to keep up to date with your progress, good luck girl - though I'm sure you'll absolutely smash it. This session sounds like it was SO much fun! I completely agree that sometimes you just need that 'kick-start', I've recently gotten back into spin class and am bloody loving it lately!